Achill Island occupies an area of some 57sq miles but its actual coastline - including all the inlets and spars - measures over 80 miles. In some places, the roads follow (generally) the shoreline and two particular stretches of road have been designated as Achill's Atlantic Drive. Taken together these two stretches of 'Atlantic Drive' provide a spectacular journey with breathtaking views and can be completed in a vehicle or (separately!) by bicycle or on foot. The first section of the Atlantic Drive begins at Mulranny, close to the junction between the main N59 road and the R319 that leads to Achill. Approaching from the Mulranny side of this junction, the exit for the Atlantic Drive appears on the left hand side, prior to the larger junction. It is signposted 'Currane'. The first point of interest should be visible on the left hand side within a few hundred metres of joining the Atlantic Drive. You should be able to see (tide permitting) the golden strand at Mulranny, a Blue Flag beach. As you turn the corner and leave the scattered cottages behind, the water to your left is Clew Bay. You are following the north side of this Bay, which is reputed to hold some 365 islands. On the south side of Clew Bay is a series of mountains including the distinctive pyramid-shape of Croagh Patrick (764m). At the mouth of Clew Bay, visible directly ahead of you, is Clare Island. Inland to your right is the Curraun Peninsula and its characteristic red rock should be visible in places along the roadside. This stretch of narrow road features a number of lay-bys and parking spots, including one at the site of the Spanish Armada memorial. The stone plaque here was erected in remembrance of the Armada ship San Nicolas Prodaneli which was wrecked close to Toorglass (Currane) in 1588. As you continue along this twisting road, cottages begin to appear as you pass through the villages of Dooghbeg and Bolinglanna and towards the village of Currane. This village was formerly home to Sir Robert Peel, founder of the British police force, and also had a working copper mine. A tropical garden was established in the 19th century at Curraun House, home of the landlord Dickens. The garden is long gone, but this historic building is now a local pub called 'The George'. As you drive through the village of Currane you are now proceeding parallel with the south east shoreline of Achill Island, visible across the waters of Achill Sound. 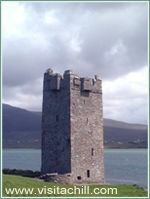 The 16th century tower house at Kildavnet should be clearly visible across the water, close to the lifeboat station and its distinctive orange lifeboat vessel. 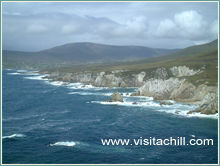 Continue to follow the shoreline for several miles until you reach a junction with the R319, signposted to Achill Sound. Turn left and follow this road for four miles to the bridge at Achill Sound.